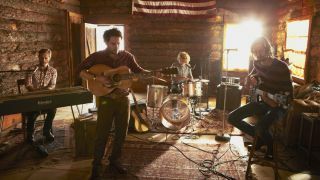 On 9 April, the Los Angeles-based roots rock band Dawes will release the album Stories Don't End, their follow-up to 2011's Nothing Is Wrong. In the video above, band frontman Taylor Goldsmith and album producer Jacquire King (Tom Waits, Kings of Leon, Norah Jones) discuss the collaborative approach they took in the studio. In advance of the release date of Stories Don't End, Dawes (which also Taylor's brother Griffin on drums and vocals, along with bassist Wylie Gelber and keyboardist Tay Strathairn) are on a mini tour of indie record stores in the US. From there, on 5 April, they hit bigger stages as the opening act for Bob Dylan. In May, fans will be able to hear Dawes paired up with John Fogerty on the song Someday Never Comes. The track appears on the legendary rocker's album Wrote A Song For Everyone, which features match-ups with Foo Fighters, Bob Seger, the Zac Brown Band and Kid Rock, among others.